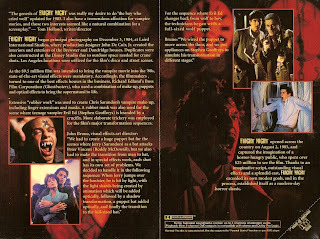 So as you're aware I've been cruising the shelf space of Wal Mart and I bought a copy of Fright Night on DVD. I've already had the disc for years, but something seemed different about the one I just bought. It's a bit hard to tell from the above scan, but the quality and color depth of the 2006 Sony disc's cover art is weaker than the original 1998 edition. 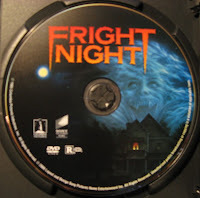 The 1998 has the normal "glossy" quality of professional DVD covers while the 2006 has the picture noise and dull appearance typical of being ran off from a more conventional PC printer. You'll also notice all the little changes in between the two layouts. Most interesting are differing runtimes. 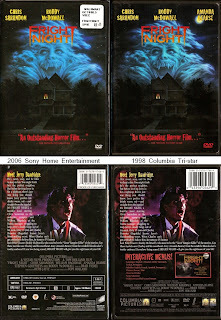 The Sony states 108 minutes while the Columbia lists 106 minutes. Also the Sony states "Remastered in High Definition" and drops the Full Screen version found on the flipside of the Columbia disc. There's been a properly framed HD version making the rounds on-demand, so I was curious to see if the encodes were the same or different. Identical encodes all created on July 22nd, 1999 running at 1:46:24. Where's the Blu-ray? There are other differences though. Since the 2006 edition drops the pan and scan hackjob; its DVD has artwork as opposed to the double data sides on the old edition. The trade-off is the loss of the original edition's linear note/chapter list insert. If you have the 1998 disc, keep it, and if you don't--find it to gain the insert. 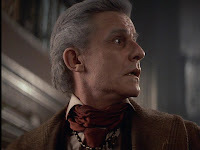 Coolest vampire movie from the 80s, no doubt about it! I guess I got the good dvd, I got the 1998 copy of it. I never did understand why Charlie had to light all those candles in his room as he carved those stakes. But the rest of the movie is a masterpiece! OH but whatever, I put logic aside cause the movie is just so damn fun!